The most important truths in life are few, and yet so hard to set down in words. This is why literature endures, century after century. Each generation, each society, has to find new ways of expressing the same truths. There are many paths to learning these truths — literature is one that has long held value to me. Likewise, swordsmanship. There are deep truths buried in the practice of Katori Shinto Ryu — but expressing those truths is almost impossible. 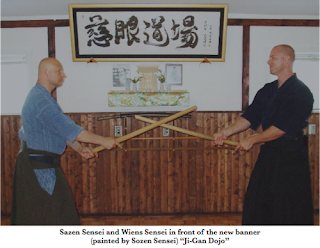 We had another lovely visit with Sozen Sensei this past July. A gifted practitioner of Sugino-style Katori Shinto Ryu (he holds a fifth dan in the style), I know Sozen Sensei from Japan, where we practiced together for years at Sugino Dojo. This year, instead of working on one kata after another, Sozen Sensei spoke of the differences between “principle” and “technique”, and we spent the weekend exploring the myriad techniques that arise from the principles of Katori Shinto Ryu. For example, an early move that must be learned is a way by which uketachi (the partner who receives the attack) may receive an incoming cut from kirikomi (the partner who initiates the attack) in such a fashion as to not only deflect the blow, but place his own sword in position for a thrust, forcing kirikomi to retreat. The principle is simple enough — bring your sword down in time with your opponent’s, the tip directed at his center. Actually performing it is not quite so simple, of course. Katori is a style in which what is seen is not always what is happening. The principle — the action that is practiced over and over again until it becomes automatic — is not in fact the technique. We practice the principle in the kata, because in the principle is the simplest truth that must be manifested in that moment. Match the timing, keep your tip in the center. You need not know what you are doing at this point, but if you simply practice it again and again, the techniques that are available in this principle will begin to reveal themselves. Strike the enemy’s sword down. Cut the wrist. Lean in and cut the throat. Slide back and thrust in deeply. These objectives, these desired results, are all techniques, and in any given manifestation of the principle, some techniques may be possible and others may not be. It is impossible to know ahead of time which technique ought to be used. But the principle is always valid. When we practice the kata, at times these techniques may spontaneously arise, and this is fine. But we should never lose sight of the principles themselves, and we should always return ourselves to these simplest truths that Katori reminds us of. Maintain one’s center. Understand the lines of engagement. Manage distance. It’s impossible to share these insights. They cannot truly be transmitted through words, but that makes them more, not less, important. Our words are a technique. A novel is technique. A cut to the wrist is a technique. The wisdom that lies behind the cut, the novel, or the words — that’s principle.